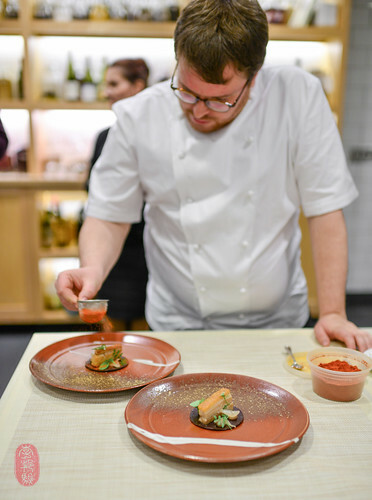 One of the three guest chefs at this year’s Twelve Days of Christmas whose restaurants I have not visited is Isaac McHale and his Clove Club in London, England. 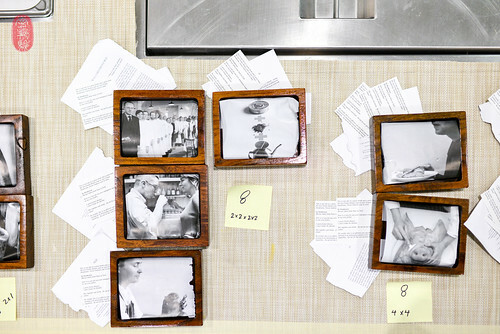 * I know of him, of course, from his short stint with his merry band of Young Turks, which included James Lowe (now chef of Lyle’s in London) and Ben Greeno, who left the group to become head chef of momofuku Seiobo in Sydney, Australia (Greeno has since left Seiobo to become head chef of The Paddington in Woollahra, a neighborhood in Sydney). But neither did I eat at their pop up at the Ten Bells, nor had I met any of them, nor had any of their food. So, I very much looked forward to this eighth night, when McHale cooked with Christopher Kostow at The Twelve Days of Christmas. McHale cooks full-tilt with flavor. 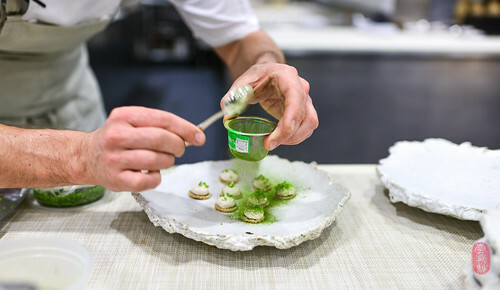 With the exception of his scallop dish – which I found cloying and heavy with truffle oil (probably magnified by hazelnuts) – most of it was great. I loved his buttermilk-fried chicken nuggets, dusted with pine salt. 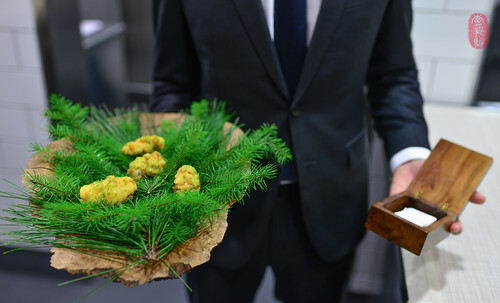 These were served piping-hot out of the fryer on a bed of pine boughs as a canapé. I loved his “little blood pancake,” which he used as a mini tortilla for a delicious morsel of pork belly dusted with what McHale called “devil’s spice.” This was great. And I even loved his “flamed mackerel,” to which I hesitated at first. I winced when it landed in front of me, the flesh looking raw and the skin blackened by a good torching. Fatty fish, especially the skin, often give off a metallic, fishy flavor when prepared this way. And I hate that. Perhaps the jarringly hot English mustard McHale served on the side was meant to bring relief, I thought. But not in this version. The fish was surprisingly clean, particularly the skin, which tasted much more of char than fish. And the only relief the mustard provided was the thin line it cut through the delicious, flavorful fattiness of the mackerel. The best thing that McHale served, in my opinion, came in a glass. 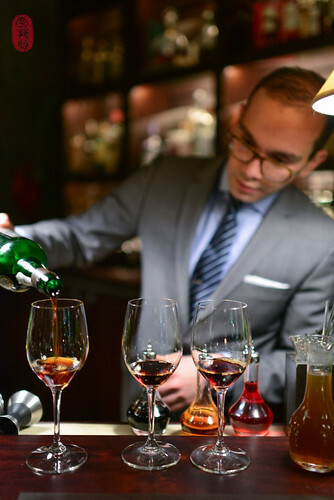 First, he had servers pour 100-year-old Port into our glasses. We were asked to sniff and taste it. 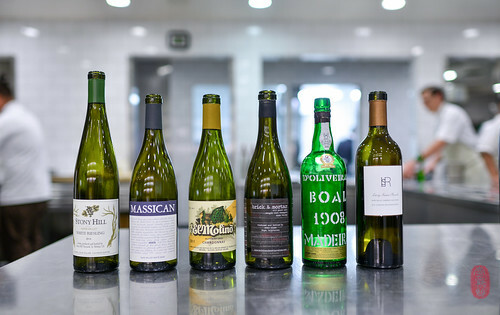 A few moments later, the servers came around with steaming carafes of duck consommé, which was poured into the madeira, fogging up our glasses and producing a wonderfully fragrant smell. I was surprised how the meatiness of the broth chased away the sweetness of the wine, each enriching the each other. It was perfect for a chilly, winter night. 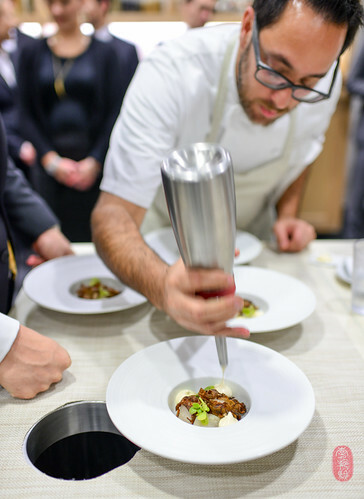 Kostow presented two truly stunning courses this night. I’ve had his cod with crispy sunchoke skin before. And I didn’t mind having it again. It’s one of my favorites. He also served a tender cut of lamb topped with a dried plum. All of this was sauced with a minty lamb jus table side. Together, it was a simple, but extraordinary course. The other petit four was a tribute to McHale’s Scottish heritage (which can be detected in the slight lilt in his accent). He served mini barley cakes, redolent with peat. They weren’t very sweet, and even a bit salty. I especially loved this warm little ending to the night. Below, you’ll find the menu from the eighth night of the Twelve Days of Christmas featuring Isaac McHale. To see all of the photos from this dinner, CLICK HERE. Sheep’s milk yogurt, wild fennel granité. * Since Kyle Connaughton, who cooked on the ninth night of this year’s Twelve Days of Christmas, has not yet opened his anticipated restaurant Single Thread, I am not counting it as a fourth. Photos: Dusting oat cakes piped with creamy cod roe; buttermilk-fried chicken dusted with pine salt; Isaac McHale dusting little blood pancakes with “devil’s spice;” Christopher Kostow piping sunchoke purée onto his cod dish; Frederico MacMaster pouring vintage Madeira; the wine pairings; and petits fours trays lined with pages from Fergus Henderson’s “The Whole Beast: Nose to Tail Eating” cookbook.